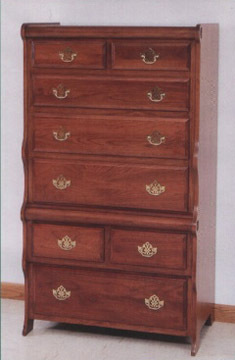 Now we present our solid hardwood Amish crafted sleigh style chest on chest. Made of solid cherry, and designed to match to our raised panel sleigh bed, our three drawer nightstand, the lingerie chest and the rest of our sleigh style bedroom furniture. You will find that, as with most of the rest of this collection, the depth is the same unless you opt for the smaller night stand, so you can arrange your furniture without worrying about mismatched sizes. With 8 drawers of varying sizes and depths, you should have room for a wide variety of different clothing types, or the other items one often finds hiding in the dresser - this is truly Amish bedroom furniture at its finest.